I would like to enter this card into the FSC current card challenge of "My Favourite Things". Hahaha...I keep looking for Julie Andrews in the distance. A wonderful card Judy! This is The Sound of Music all over. 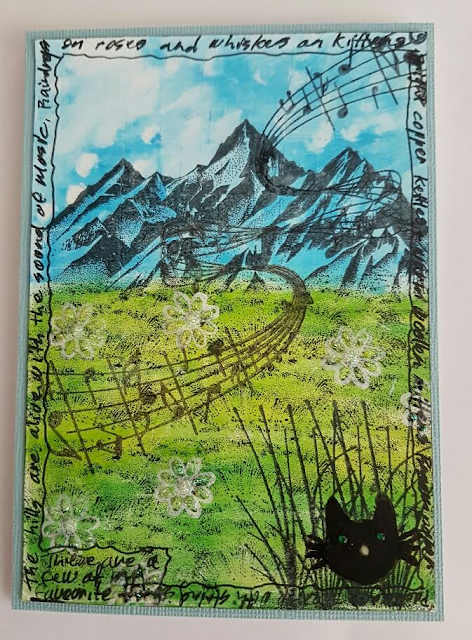 What a super take on our theme and very imaginative stamping, many thanks for sharing with us at Fashionable Stamping Challenges. This is a brilliant make for our current theme from The Sound of Music! What an effort! The second I spotted your entry it shouted The Sound of Music at me - well done you! Thank you for sharing this with us at Fashionable Stamping challenges and joining in with my chosen theme this time, Leanne DT. Oohhh I spy Stampscapes stamps! Lovely scene Judy, and I can believe the hills are alive with the sound of music! Perfect illustration of the theme. Wowww, very beautiful! Thanks for sharing with us at Fashionable Stamping Challenges.